Another 54 British Airways flights are to be cancelled on Saturday as problems at Heathrow's new £4.3bn Terminal 5 spill over into a third day. More than 100 flights were cancelled on Thursday and Friday because of earlier glitches with baggage-handling systems. 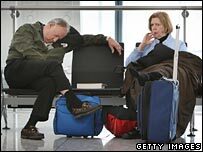 BA chief executive Willie Walsh said he accepted the chaos which marred T5's opening and left many stranded overnight, "was not our finest hour". One baggage handler said it was "a shambles the moment the doors opened". He told the BBC: "BA claimed 'staff familiarisation' was to blame. The staff, however, would blame the lack of training and the essential support that was promised." Other sources have told the BBC low morale among staff was also a factor. Airport operator BAA and BA said they were working hard to resolve baggage issues. BA, which has sole use of T5, has announced all long-haul services departing from the terminal on Saturday will go ahead, with 293 out of 347 scheduled flights in and out of the airport operating as planned. Customers are being advised to check on www.ba.com for a full list of flight cancellations. Those on cancelled services will be able to rebook or apply for a refund. Mr Walsh said T5 had a "much better start" on Friday and while there were "still some problems to overcome" the airline was planning to operate "a larger proportion" of its flying programme on Saturday. "I'd again like to apologise to those customers who have suffered disrupted journeys or baggage delays," Mr Walsh added. "Our staff in the terminal are being supported by around 450 volunteers and they're working really hard to look after our customers and offer them the world class experience that we know Terminal 5 can deliver." Cancelled flights, a temporary suspension in luggage check-in and baggage delays blighted the opening day of T5, leaving many passengers stranded overnight. BA blamed a combination "teething problems" for the chaos. Staff car parking problems, delays in getting workers screened as well as poor staff familiarisation meant many were late to their posts, the airline said. This resulted in a backlog of baggage which clogged up the underground conveyor system and meant delays and flight cancellations throughout Thursday and Friday. The company said that the backlog had been reduced from its peak of 5,000 items of luggage to 2,000. BBC transport correspondent Tom Symonds said that practice runs of T5's baggage handling systems involved hundreds of staff, rather than the thousands who were involved on day one. Ed Blissett from the GMB union said that workers had not been familiarised with the new terminal. "They didn't know where to go, what bags to get, and that caused a problem - as well as the system breaking down," he said. Another flight cabin service director, who has more than 15 years experience, said there were not enough people working at T5 on opening day. "They asked for volunteers to make up numbers at T5. I don't know anyone who would go and volunteer on their day off," he said. "Whenever in the past BA got into a mess, people helped out, but morale is so low people won't do it any more." A check-in attendant with 10 years experience told the BBC colleagues were confused about where they should go when they arrived for work. "It took an hour for people to get to the right place. The place is so enormous, we don't know where we are going, we've been given no maps no numbers to ring." Mr Walsh earlier refused to blame BAA, which operates the baggage-distribution system, for the glitches that marred T5's launch. "I'm not going to point the finger at BAA, I think it would be unfair for me to say that this was their fault; this wasn't. "Clearly both BAA and British Airways made mistakes but I have got to accept responsibility for the mistakes that we've made. We've got to correct those mistakes and we've got to make it work." A BAA spokesman said it was "focusing all our efforts on our work with British Airways to resolve baggage issues and to deliver a good service to passengers". You can send pictures and video to: yourpics@bbc.co.uk or to send via MMS please dial +44 (0)7725 100 100.